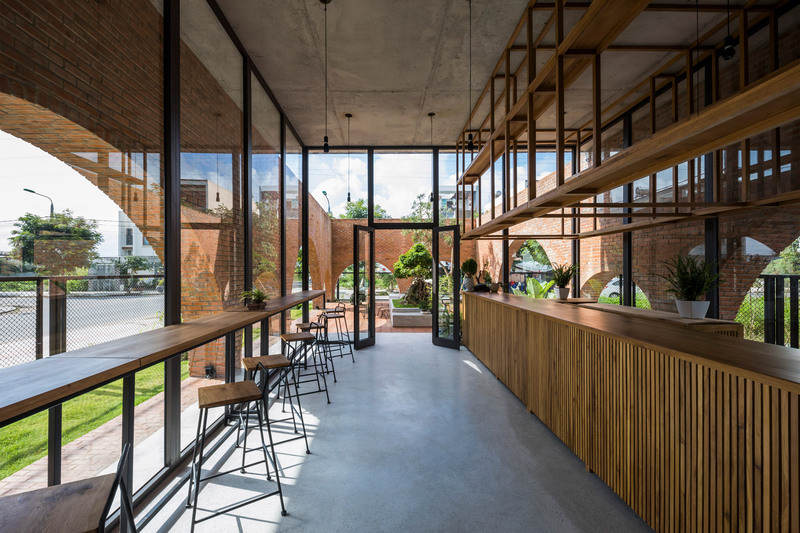 Taking its cues from a cuckoo clock, Cuckoo House is a cafe combined with a four-person house in Da Nang, Vietnam, designed by architecture studio Tropical Space. 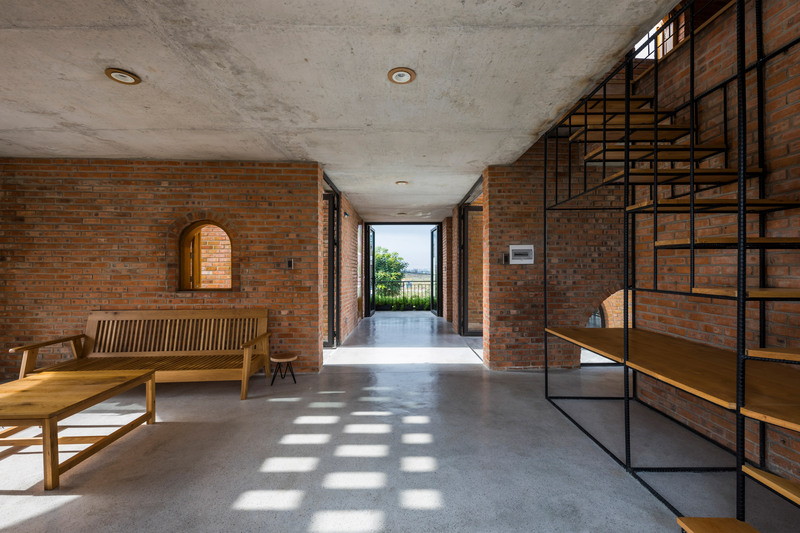 Built entirely from local clay bricks, the coffee shop forms a single-storey base, while the two-storey home sits on top and cantilevers out over the green space below. 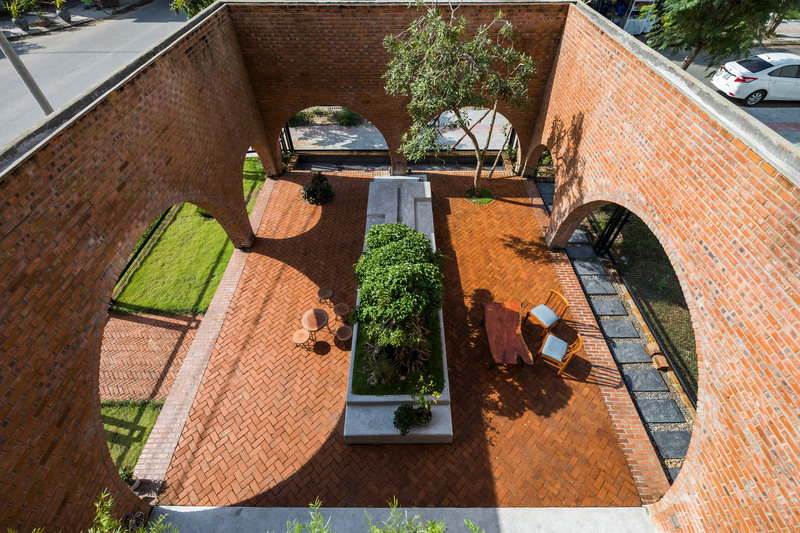 Cuckoo House’s ground floor is wrapped by a brick shell, made permeable by large arched openings. Half of this area forms a large outdoor courtyard, while the other half houses the glass box of the coffee shop. The various elements of the programme are all held together by what the architects called “buffer layers”, areas of loosely programmed space that encourage movement out of rooms and chance encounters. “Habits mean most people’s daily lives usually take place in functional spaces,” said the architects. For the home, these buffer areas are the uncovered space between the three blocks. 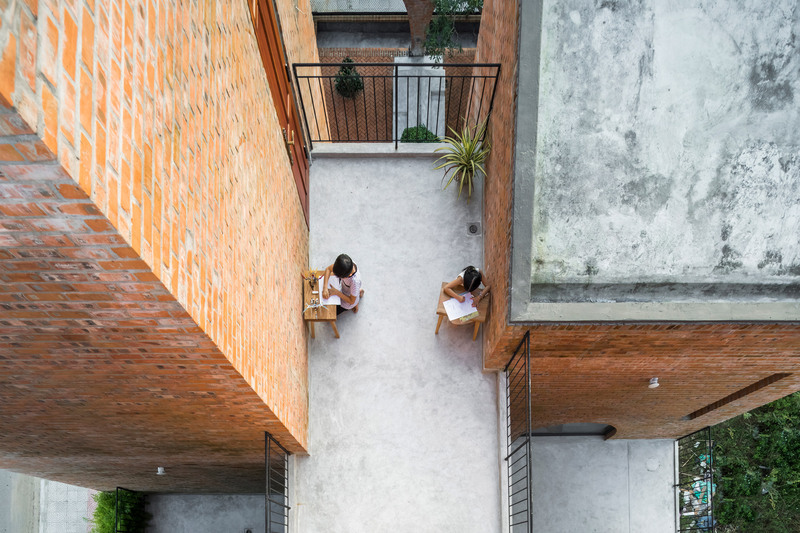 They take the form of elevated, planted alleyways that run through the brick forms of the house, which is split into three distinct blocks. Depending on the level of privacy desired, various areas of the house can be connected or closed off via these buffer areas, through windows and small cuckoo clock-style wooden doors. These open areas are also part of the natural ventilation strategy, allowing cool air to flow through the home during hot summers. The spaces of the home continue the arched language of the ground floor to provide large windows, while above bedrooms are given more privacy with a perforated brick facade, which also provides the potential for natural ventilation if the inner layer of glazing is opened. 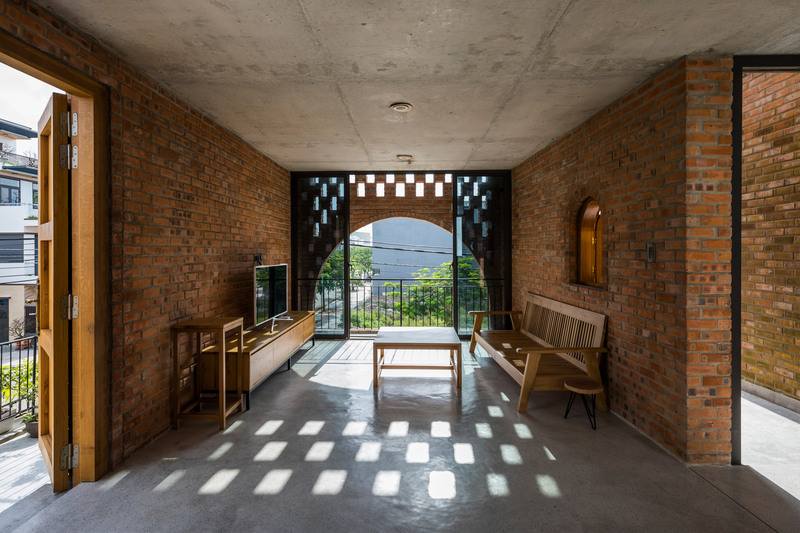 Internally the brickwork, along with exposed concrete and wooden floors, creates cool, shaded spaces, dappled with the light that enters through the facade. Tropical Space has form with using these strategies to bring natural ventilation into its designs. 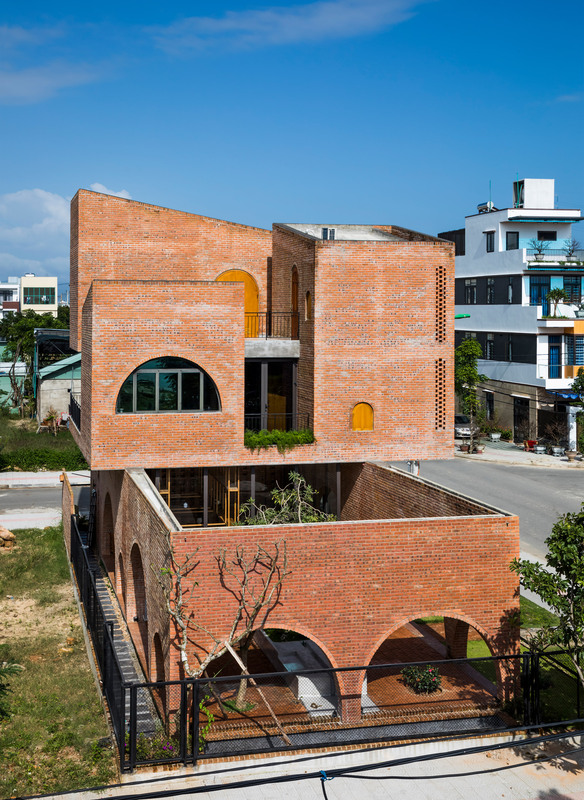 Shells of perforated brickwork were used to surround both their Termitary House project, also in Da Nang, and Terra Cotta Studio near Hội An. 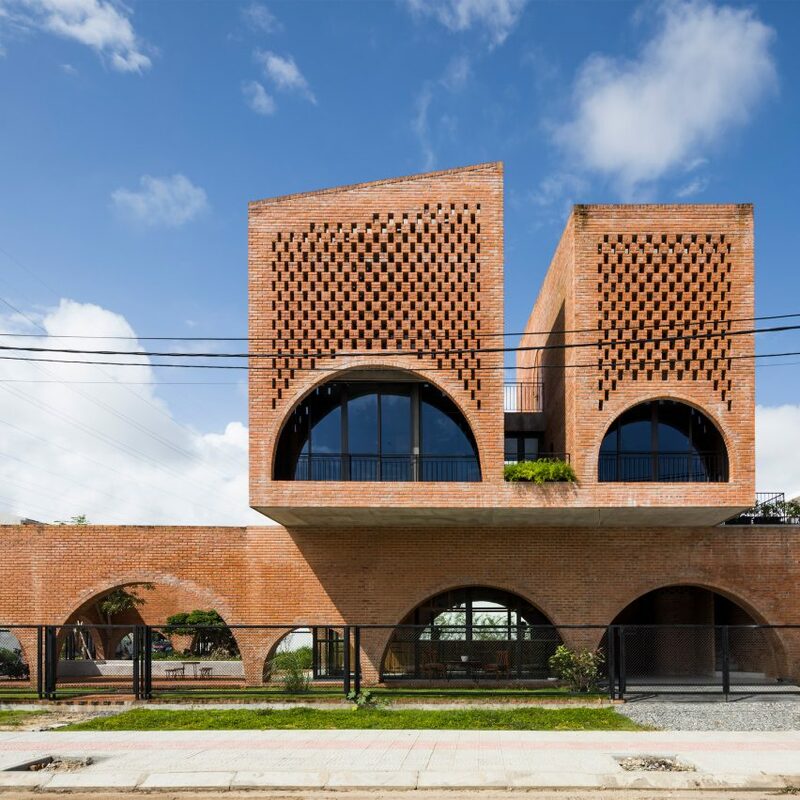 The post Tropical Space builds brick coffee shop with a house perched above appeared first on Dezeen.